The enchanting turquoise lakes and verdant mountains of Northern Garda and Trentino offer a treasure trove of idyllic villages, outstanding wine estates, gourmet restaurants, and historic castles. This area is fairly off the beaten track and offers a truly authentic side of Northern Italy. On this private Mercedes chauffeured tour of Trentino, you will visit the region in style! You will have two contrasting bases for the vacation- a sumptuous Royal Palazzo on the shores of dreamy Lake Garda; the other a beautiful boutique palace with chic contemporary design, in the heart of historic Verona. Taste delicious, unusual wines made from interesting local grapes like Teroldego, Riesling Renano, Traminer Aromatico, Nosiola, and Lagrein. Visit beautiful locations like lakefront Malcesine, the ski mecca of Bolzano, the majestic Dolomites, and elegant Trento. Indulge in world-class spa treatments, climb ethereal castle ramparts, and enjoy memorable food experiences like a private Italian cooking class on the lake, olive oil tasting and Michelin starred dining. This is a fabulous week to recharge your batteries and deeply relax. Upon arrival at Verona (or Venice) airport, your elegant private driver will be waiting for you in arrivals and you will be swept away to the fairy tale winelands of the Vallagarina in Trentino. 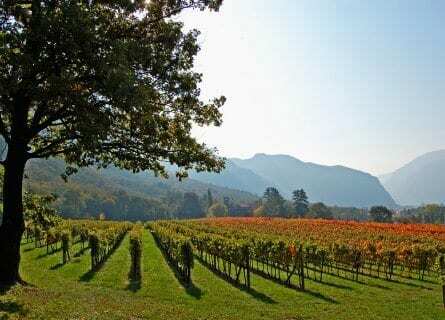 Destination: Tenuta San Leonardo, one of the most prestigious and beautiful wine estates in the region. Owned by Marchese Guerrieri Gonzaga, the property has a mind-boggling amount of history. Wine has been cultivated in this area since 900 AD even before that it’s said a famous wedding took place between the Princess of Bavaria and the King of the Lombards here. The beautiful villa you see at the winery now dates back to the 1700s and was used as headquarters for the Italian army during WWI. You will fall in love with the location and will enjoy a private, exclusive tour of the property concluding naturally with a tasting of their fine wines including their flagship San Leonardo wine which is a Bordeaux blend, the excellent Villa Gresti (which very unusually includes Carmenère), also their super Grappas. Lunch will follow at one of our favorites, Casa del Vino in Avio. On the terrace overlooking stunning mountain scenery, enjoy a superb lunch paired with excellent Trentino wines. After lunch, stretch your legs at the Castello di Avio, an evocative medieval castle dating back to the 13th century (and the keeps are even older) set overlooking Avio village. It’s a gorgeous spot and you can enjoy a walk on the grounds and the interior including the “Stanza d´Amore” (Love Room) with beautifully painted frescoes. Both the emperors Charles V and Maximilian of Habsburg have stayed at this castle! In the late afternoon finally, head to your fabulous lakefront hotel. You are staying at Lido Palace, a mythical luxury hotel, and spa in Riva del Garda. Riva was a favorite lake resort for the Royal Habsburgs in the late 1800’s and a number of famous guests have stayed here from Russian aristocrats to the Vanderbilts. These days it is a very cool, renovated top class resort offering a stellar spa, a Michelin starred restaurant and more informal dining options, not to mention extensive gardens and views to die for. Have a lovely evening and settle in. Have a late breakfast and enjoy the resort facilities and grounds this morning. You might like to do one of their revitalizing treatments like the white grape facial or regenerating foot massage. 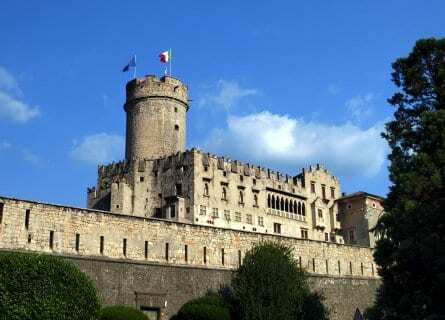 Head to Trento in the late morning and before lunch, you will visit the Buonconsiglio Castle, one of the most spectacular castles in a region full of amazing castles. The Castello del Buonconsiglio was the sumptuous residence of the “Prince Bishops” of Trento for 5 centuries, until the 1700s and there is much to see in the complex including the Torre del Falco with its frescoes and the Magno Palazzo with its romantic Loggia. After a relaxed morning of history and great scenery, you will visit beautiful Trento for lunch and a tour. A convivial “pranzo” will be organized for you at Scrigno del Duomo, in a dining room set in a 17th-century wine cellar. Have an aperitif with the sommelier’s guidance under the pergola and then sit down to a terrific creative lunch. The chef always has excellent seasonal dishes that in fall might be ravioli with pumpkin mousse and sage and in spring might be orecchiette with fresh peas and pancetta. After a chef’s tasting menu, enjoy a digestive walking tour of this most delightful town. Explore the enormous Renaissance Duomo, the medieval Palazzo Pretorio and admire the facades of the Palaces on the Via Belenzani. You’ll have some free time to poke around Trento’s cute shops and cafes on your own after the private tour. Head back to your resort in the early evening. We suggest you try the onsite Michelin starred eatery, Il Re della Busa. Get a table on the candlelit terrace and taste dishes like seared scallops with smoked potatoes and raspberry citrus vinaigrette, and Cannoli stuffed with lake pike, wild spinach, and pine nuts. This morning you have a picturesque half hour drive to the sublime Castel Noarna. This captivating 11th-century castle set amid vines under the mountains is a treat to visit. You will start with a tour of the castle, see the frescoes and learn about the witches of Nogaredo before carrying on to a tasting of their estate wines. Begin with their Nosiola and Salvanel whites, both floral wines that remind you of the lush wildflowers of the region. Their Campogrande chardonnay aged in oak for up to 4 years is rich and luscious, a real winter white. Taste their Lagrein (native red varietal), Mercuria (a blend of Lagrein with Cabernet Franc, Cabernet Sauvignon, Merlot, and Teroldego) aged in barrique then bottle for a total of 2 years, and conclude with their top red, Romeo (similar blend to Mercurio). You will almost definitely be famished by now and lunch is just down the road at the warm and cozy Locanda delle Tre Chiavi (Three Keys Inn), a Slow Food hub with a zero mile ethos. Taste local dishes like potato cake with smoked cheese and speck, pork ribs with crispy polenta and sauerkraut, and apple strudel with cinnamon ice cream (this area is nearly South Tyrol and the cuisine is heavily influenced by Austria). After a delicious filling meal, take in a vineyard walk at the Balter estate. Your host will give you a tour of the boutique cellar, castle and wine cave before enjoying a tasting of their best wines including the sparkling Brut Riserva, which won the coveted Three Glasses award by Gambero Rosso. Arrive at your resort in the early afternoon and relax. 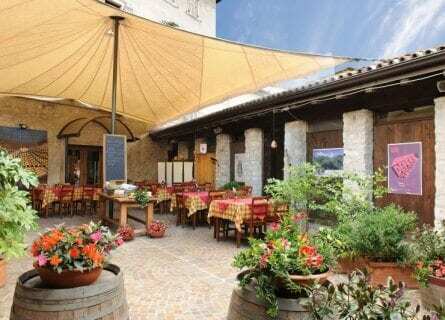 Tonight we suggest a visit to darling Malcesine, about 20 minutes from your hotel for an aperitif and dinner tonight. You have a neat day in store! First up is a visit to the bewitching Castel Thun, dating back to the 13th century. Located near the little village of Vigo di Ton, you have a great panorama over the valley and mountains here. With all the rich cuisine this week, it’s lovely to get on some scenic walks and you can enjoy a tour of the castle grounds and a walk to the hamlet if you like. 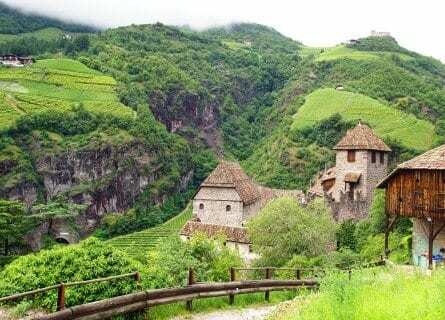 Carry on to Bolzano, further north, passing expanses of vineyards en route and taking in views of the mountains in the distance in the Monte Corno national park. Arrive at Bolzano and enjoy some free time to explore o your own. A visit to see the worlds oldest preserved neolithic “Iceman” at the South Tyrol Museum of Archaeology is highly recommended and fascinating. Bolzano (called Bozen by the local German speakers) is very quaint with elegant arcaded streets, beautiful piazzas, pretzel sellers, wine bars, beer halls, and colorful facades. Known as the gateway to the Dolomites, the alpine backdrop is picture postcard perfect. Enjoy free time here before heading to San Michele for an extraordinary lunch. Super Top Chef Herbert Hintner (cookbook author of “My South Tyrolean cuisine”) is at the helm at Michelin starred Zur Rose, the gastronomic mecca for foodies visiting Northern Italy. Sit on the charming terrace and dedicate the next few hours to tantalizing your taste buds with the chef’s taster menu. Enjoy pairings of South Tyrol/ Alto Adige wines from estates like Alois Lageder, Elena Walch, and Manicor. Before heading to your resort in the late afternoon, you can visit the Castel Roncolo, there is a gentle hike there which will aid the digestion! Free evening to enjoy a lakeside walk and a light bite. 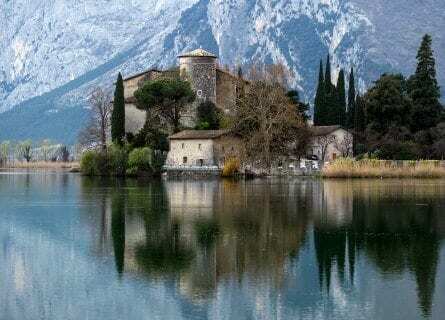 There are castles and then there are castles with drop-dead settings and Castel Toblino is possibly the loveliest jewel in this truly lovely region, set right on a lake and looking like a scene from a Grimms Brothers story. You will start your explorations here at the Cantina Toblino, a sleek wine estate making a wide range of excellent wines. We will include some of our personal favorites for you to taste such as their Pinot Grigio, Manzoni Bianco, Gewürztraminer, Kerner (crossing of Trollinger /Schiava and Riesling Renano) and for the reds- Teroldego, Lagrein Dunkel and concluding with their excellent Elimaró wine made with Rebo and a Rigotti crossing. We will send you away with a gift of their premium L´Ora grappa today, to take back home with you. Lunch is next right at the 16th-century castle overlooking the lake. Chef Stefano Bertoni’s signature style is healthy, local cuisine reinterpreted. You can choose from the lake or land tasters, and fish lovers will love the Bigoli pasta with Lake Sardines, Pine Nuts, Raisins, and Candied Lemon while meat fans will enjoy the Spiedò (Steak fillet with porcini). Enroute to Verona, your base for the next two nights you will stop in one of the best olive oil producers in Italy, Olearia Caldera, located on the Western shore of Lake Garda in the picturesque Valtenesi Garda. Seriously chic olive oils! Enjoy a tour of the frantoio and a tasting of some of their best high end oils including Garda Bresciano D.O.P. 100% Casaliva Extra Virgin, Garda Bresciano D.O.P. 100% Leccino Extra Virgin, and the Gran Cuvée Ugo Caldera Olio Extra Vergine d’Oliva (made with Leccino, Gentile di Chieti, Peranzana, and Coratina olives). Fun and you will find it hard not to buy half the shop! This evening you will arrive to romantic Verona, one of Italy’s most elegant towns. 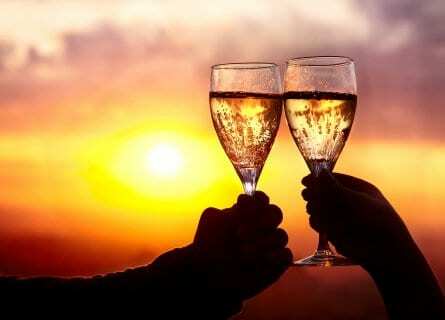 Free evening to explore the city´s sights and restaurants with our tips. Shake things up today with a fun, private hands-on cooking class at the darling Gemme di Artemisia restaurant, overlooking the silver-blue waters of Lake Garda. Your hosts Lara and Andrea enjoy teaching cooking as much as cooking and they will transmit this passion and good humor to you over a very entertaining morning’s class of three courses which can be adapted based on your food preferences. You can include lake fish and fresh seafood, homemade pasta, veggie or desserts- from easy to advanced level depending on your confidence in the kitchen. Sip wine while you cook and chat, and then sit down to a romantic table directly overlooking the lake and relax over the meal you made. Even non-cooks will appreciate the views, wine, and setting. After lunch, head back into Verona. Freshen up and enjoy some free time for sightseeing, resting, shopping, Verona has beautiful specialty shops for food and wine lovers and great shoe shops. In the early evening, your private guide will meet you in the lobby and take you on a sunset tour of the town. Begin with a visit to the ancient Roman arena, where the annual opera takes place. Carry on to other sites like Juliet’s balcony, popping into wine bars en route. You will taste your way around Verona tonight with easygoing snacks and tastings of Soave, Bardolino, and Amarone wines. This is a great way to conclude your week in Northern Italy, enjoy! At your preferred time, your driver will take you to your next port of call (Verona or Venice airports, or the train station). You will be going home with fond memories of your tour, great photos, and a few gifts. We hope you had an amazing time and we hope to see you again!